Tintype, also melainotype and ferrotype, is a photograph made by creating a direct positive on a sheet of iron metal that is blackened by painting, lacquering or enamelling and is used as a support for a collodion photographic emulsion. A wet plate process - silver halide crystals are suspended in a collodion emulsion that is chemically reduced to crystals of metallic silver that vary in density in accordance with variations in the intensity and duration of light impinging on the emulsion. In a tintype, a very underexposed negative image is produced on a thin iron plate, lacquered or otherwise darkened, and coated with a collodion photographic emulsion. Since in a negative image the darker portions of the subject appear lighter, or in this case more transparent, the dark background gives the resulting image the appearance of a positive. 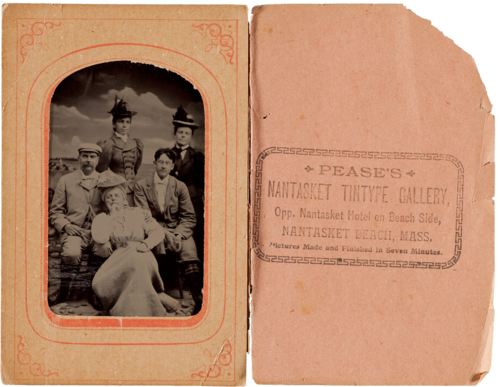 Popular during the Civil War because these images could be safely tucked in pockets, etc. George Eastman House Video: Making a Tin Type. Although this is not a part of the other George Eastman House Video series referenced on other processes, this is still an interesting video showing the process of making a Tintype.